Everything tastes better wrapped in bacon, right? 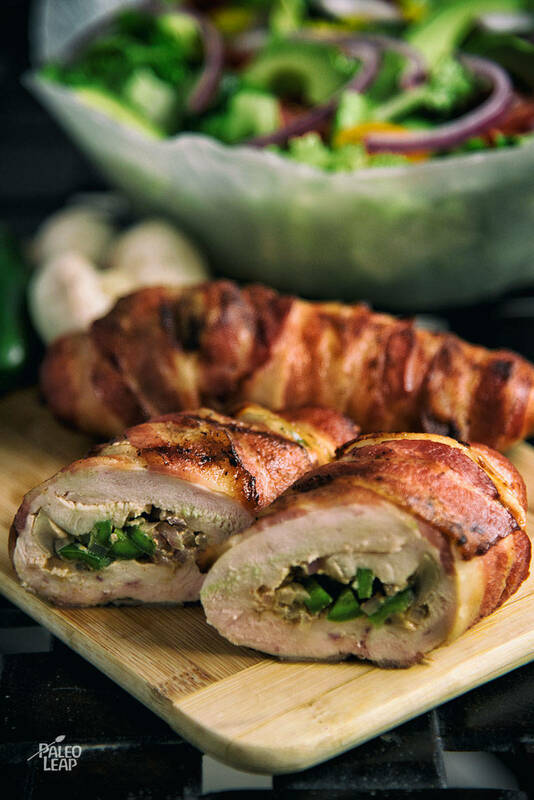 As a cult classic, bacon lends flavor and provides a crispy finish to this stuffed chicken dish. Because chicken breast is quite lean, the bacon provides a dose of fat, while the jalapeno-mushroom stuffing brings a kick of flavor, too. The technique of butterflying a chicken breast allows the breast to cook more evenly. It’s also helpful in stuffed recipes because the chicken breast is wider and thinner, so it has more surface area to top with a delicious filling. Butterflying chicken breasts may sound intimidating, but it’s not as difficult as you may imagine. To cut a breast open, place each breast on the countertop or cutting board. Hold your knife parallel to the counter and start cutting until you’ve almost sliced the chicken breast into two flat pieces. You should be able to open the chicken breast flat on the cutting board, which gives you double the surface area to spread the jalapeno-mushroom stuffing. Serve with a cool watermelon salad or cucumber salad. If you have leftover stuffed chicken, slice up and have for lunch tomorrow! Preheat grill for indirect grilling to medium-high heat. In a bowl, combine the jalapenos, mushrooms, onion, garlic, paprika, coconut milk, and season to taste. Lay the chicken flat, and fill with the jalapeno-mushroom sauce. Roll the chicken tightly and wrap each breast with bacon slices, securing with toothpick, if needed. Grill over indirect medium-high heat, covered, and cooked for 25 to 30 minutes, turning every ten minutes or until chicken is cooked through and bacon is crispy.